Shelties, as they are affectionately called, hail from the rugged Shetland Islands, which lie between Scotland and Norway. These islands are also home to the Shetland Ponies and Shetland Sheep, all diminutive animals. Shetland Sheepdogs were bred by crossing the Border Collie, the rough Collie, and various other breeds. By 1700, the Sheltie was completely developed. They were developed to herd the sheep flocks of the Shetland Islands, and also to protect them from birds of prey, such as eagles. You can still catch Shelties chasing birds. 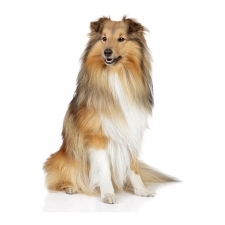 Today, the Sheltie is one of the most popular dogs in America. Shetland Sheepdogs are hardy, loyal, obedient, gentle, loving, and extremely trainable. They are incredibly intelligent, ranking 6th out of 12 different dog breeds according to Dr. Stanley Coren, an animal intelligence expert, which means that they understand new commands with less than 5 repetitions and obey first commands 95 of the time. This dog needs a job with plenty of exercise or else they might invent their own entertainment. They are also very in tune to their owner’s thoughts and moods. Shelties are devoted family pets and are especially fond of children. They love attention and love to learn. They thrive in an environment where they’re given playtime, training, and loving attention. They will love you in return tenfold. Shelties usually weigh between 12 to 18 pounds and stand approximately 12 to 15 inches tall. Their build is trim with a light frame. They are incredibly beautiful dogs and are known for their beautiful coat. The Shetland Sheepdog’s coat is long and straight. It has a harsh-texture with a soft, short-haired close undercoat. Color combinations include sable, tricolor, and blue merle. Shetland Sheepdogs still retain a strong herding instinct. You’ll find Shelties still chasing and trying to herd squirrels, rabbits, and children, running around them, barking and sometimes nipping. They are so intelligent that they do very well in agility events.